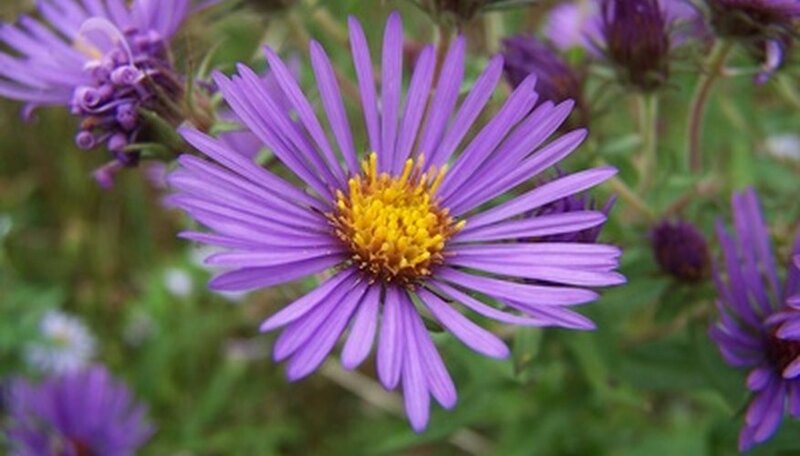 Purple flowers appear on all types of plants, from trees to bushes. As you encounter an unknown species of flower, it can be tough to identify the plant because it may grow in unusual shapes and colors that you have never seen before. Fortunately, these distinct traits are exactly what you need to get the information that you are looking for. By noting a few key characteristics, identify the purple flowering plant you have encountered. Wait for the plant to begin sprouting its purple flowers. The characteristics of the blossom are key to pinpointing the plant's species. Further, note the month(s) that you see the flowers to get an idea of when the growing season occurs. Write down the distinguishing traits of the plant. For example, is the purple flowering plant a climbing vine or is it more like a shrub? Note the details of the foliage. For instance, are the leaves rough or smooth to the touch? Are the veins in the leaves a different color? Inspect the purple flowers to see if they bear other colors. Are the petals purple and white like the Bird's Eyes, or are the blossoms completely purple like the New England Aster? Record the growth pattern of the purple blooms. Some purple flowers, such as the Rocky Mountain Bee Plant, grow in a group on the vine, while blossoms like the Pale Coneflower grow on single stems. Point your browser to the United States Department of Agriculture (USDA) website and click the "Advanced Search" link on the left side of the page. (See Resources.) Click the options in the various sections, such as "Morphology/Physiology," to choose the characteristics that best match your purple flower. Continue by clicking the "Display Results" button at the bottom, and then click through the resulting page links until you identify your blossom.